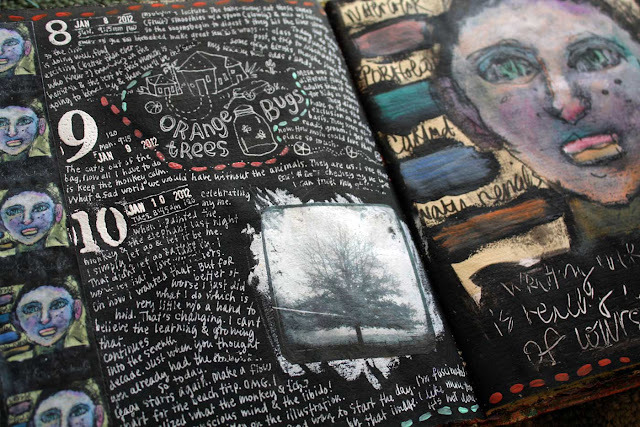 This is my big-big Art Journal. It's over 16x23 inches opened up and has sheets of 300# Arches paper for pages in a coptic bound format. The cover was inspired by an illustration by an artist whose name I had and then lost again (if I can find it I'll amend this post). His monkey was on a tiger which represented the id but my id is so slow lately that an elephant was more in line with truth. An elephant on skittery wheels. 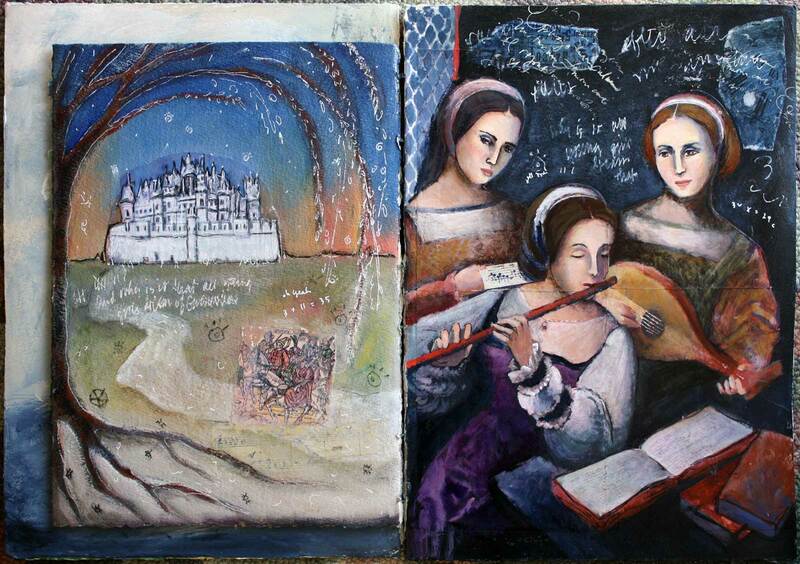 The artist on the Catherine Wheel was painted on the back cover after a late night session with a group of friends where the suffering of artists was the topic of conversation. We don't suffer because we're artists; we're artists because we feel everything so deeply. And because we are driven to communicate in a language only our tribe understands. To the rest of the world we are just weird, weepy or mental. Still, we wouldn't trade our lives with anyone. Not one of us, we agreed, would trade our age for youth. We love the puddles in which we find ourselves. I've been sick for a week now; subjecting a house guest to my gusty sneezes and trips to the doctor. Haven't felt like talking at all. Painting in the big-big Art Book has been my consolation. Thank you Misty for the ongoing inspiration. I could name some names here. So many good and loving friends who keep me going and make me feel worthwhile. Who seriously know the way and carry the lantern for others. I painted this one over a copied drawing. It was still hard. And now some recent journal pages. I'll be scarce in February or reporting from southern climes. Going to do some high-tailing. Have a sitter who will send out Hot Wax DVD's for me and help me stay in touch though. 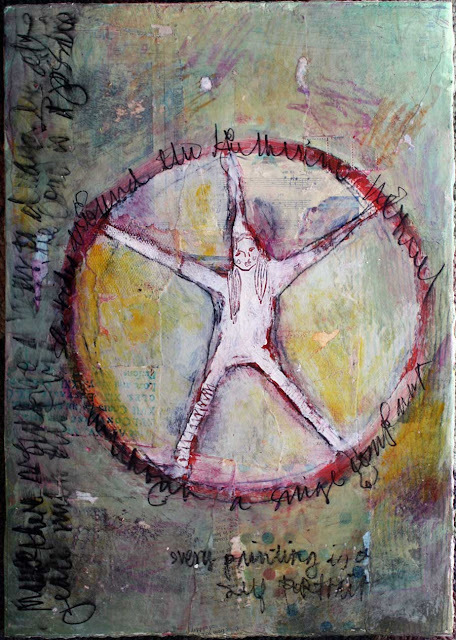 And I'll be responding to the Mixed Media Journal Class sign-ups. In the meanwhile, get your flu shots and wear a scarf outdoors. Listen to music that moves you and keep in touch with the people who make you happy. Let the sun shine down on your days. I'll be back asap. Hope you're feeling better soon - this post made me smile - love your (he)art! May the warmth of the sun shine on you as you head south! Rats. I just started following your blog. OH well, you'll be back. Feel better and have a wonderful high-tailing session south. 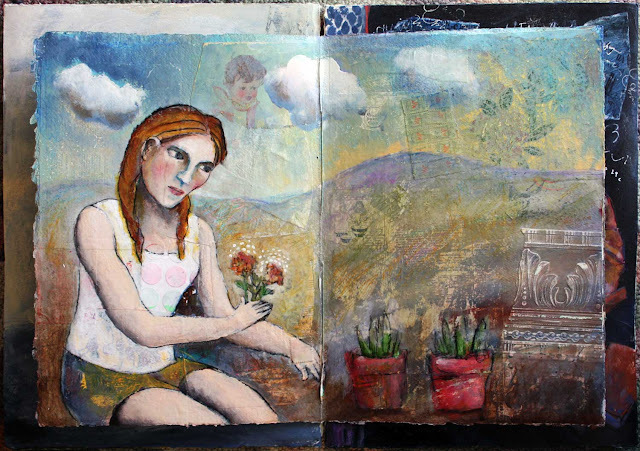 Gorgeous paintings in your big journal!! I love the monkey on the elephant and so many more!! I love the three Tudor type ladies page in your big art journal. I hope you feel better soon! GORGEOUS pages sweetie!! i truly hope you feel better soon!! take care of yourself dear soul!! Hope the flu bug died by now and you are hail and hardy again. Love all your pages and paintings. So much fun to look at and be inspired by. all are wonderful! get to feeling better soon! 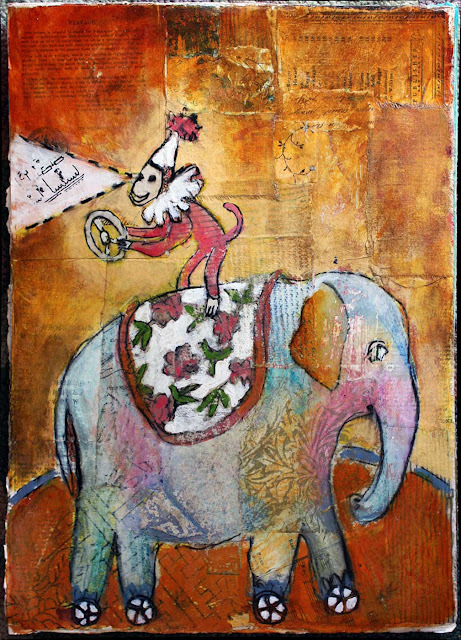 great minds think alike Judy, i did a small fun piece from a paint blob that turned into a monkey on an elephant. my quote was "please get this monkey off my back"
Feel Better Judy. You are sometimes the light that I look to on grey days. You are pretty amazing and special for all the goodness you send out into the world in so many ways so DO get better, give yourself all the rest you need to take, let others tend to you; it's ok to release yourself into someone else's care once in awhile and it sounds like you have some really good friends. 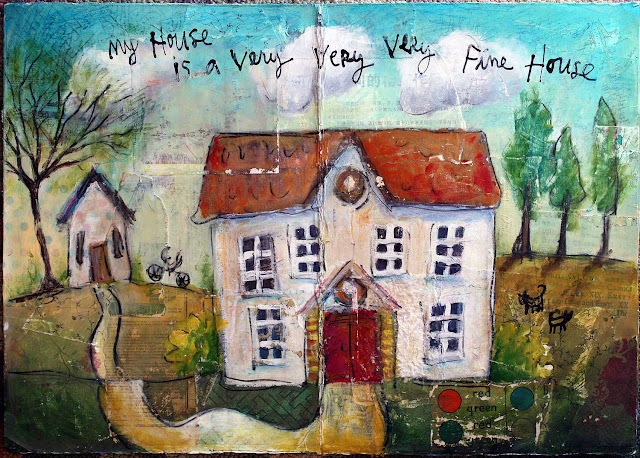 Judy, your art is so moving that it makes my heart ache. I am sorry you have to dig so deep in your soul to make it but I hope you never stop because it is a beautiful gift to see. Enjoy your time out and feel better soon! love your journal pages, and i got lost on your blog...read post after post. the beach time with creative friends looks like heaven. love your photos too. i'm in lake oswego so know the glorious pain of squinting when the sun finally comes out too. am in misty's class as well. maybe one day we'll meet...would love that. The big, big journal is wonderful Judy. I love the arches paper and the large size is fantastic. Wonderful art! All so beautiful, I cant decide which I love the most...but I think it is the monkey on the elephant and the story behind it. Slow and on those skittery wheels... I hope you are feeling better soon and feeling the warmth of some sunshine. 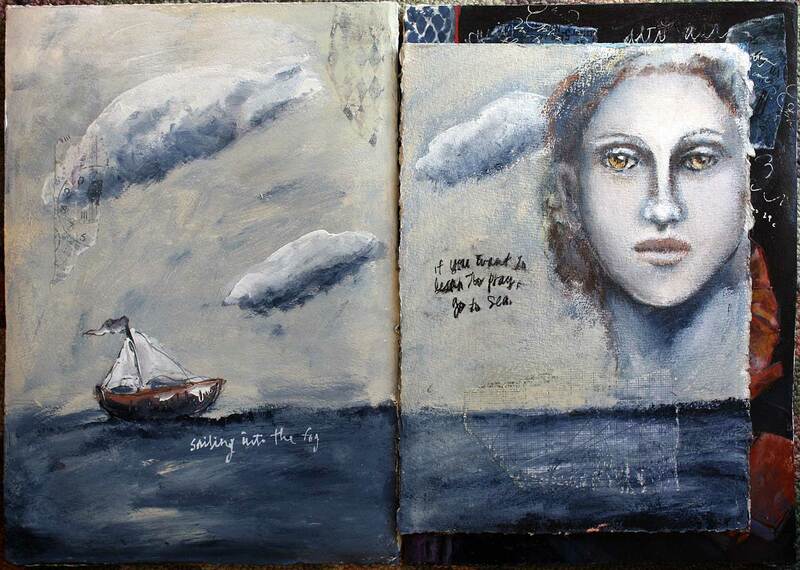 amazing pages and what an inspiration indeed..thanks for sharing, Judy..
Another, WOW! Thank you for always sharing your thoughts and art. It does make me happy! healing and blessings of sunshine...your big journal pages reflect much colorful joy and life and beauty!!! Awesome post! I loved the journal pages and the giggles you gave me, especially about what others think of artists, lol...true. I hope you get over the flu fast and that your house guest stays healthy :) Have a wonderful vacation! Judy you are an inspiration to all artists, at any age. While I was teaching a workshop last week, a young artist mentioned that she had seen you do some kind of wax technique. I smiled and thought "that is part what I want my legacy to be". Young artists remembering me for what I have imparted to them. Your rock sista! Love that heart. Love your art. Have a wonderful month. Get well and Be well. Light and love to you ! Omg, these are gorgeous!!! Your love of art and your talent are so inspiring to me. I'm sorry you've been under the weather. The San Miguel sunshine will do the trick. Wish I could go too, these gray days are tough on me. I've been looking at houses in Carmel California and dreaming of sunny skies. Such a beautiful post and lovely and inspiring art. I just found your blog and it is wonderful. I love your artwork. And I'm in Misty's class too. Been so inspired by all the posts and "meeting" all the great artists out there. I love your book and am looking forward to trying many of the techniques. I hope you feel better really fast and enjoy your time in the sun. Can't wait to see what you do next! "We don't suffer because we're artists; we're artists because we feel everything so deeply." Such a releasing thought. Like, BIG time! Thank you for teaching me this. It makes so many pieces fit together....well, more than that it makes me see the pieces differently, I guess. I had been holding them upside down and backwards this whole time. Love love love to you. Hi Judy! Take care of yourself - big cup of tea!!! I love this journal and can't wait for your online class! Are you by chance getting away to the land of enchantment?????? so sorry you are not feeling well. i am glad to hear you are feeling some better and made a blog post. you are is always amazing to look at. enjoy your trip. i am sure it will replenish your soul in ways you can't even imagine. god bless. 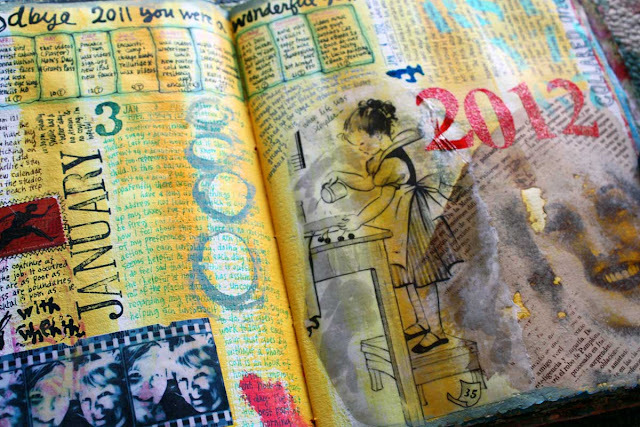 I LOVE the big art journal! Very inspiring. Get better soon and enjoy your trip. Wonderful big book. Hope your cold, flu, virus (whatever) is totally gone. Your journal pages, as always, are gorgeous. You carry that lantern high, too, lady! Oh, Judy. 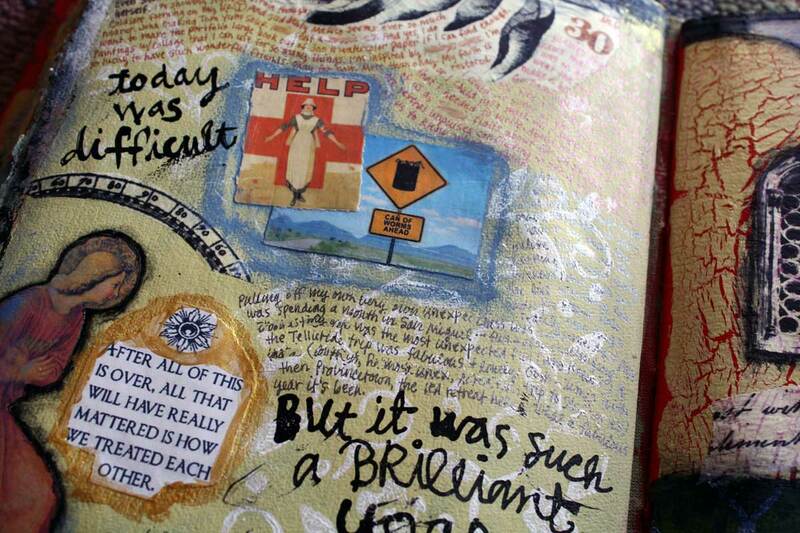 This journal is what heaven would be if it could. How awesome. I'm very sorry you've been ill. I really hope you feel better ASAP!!! 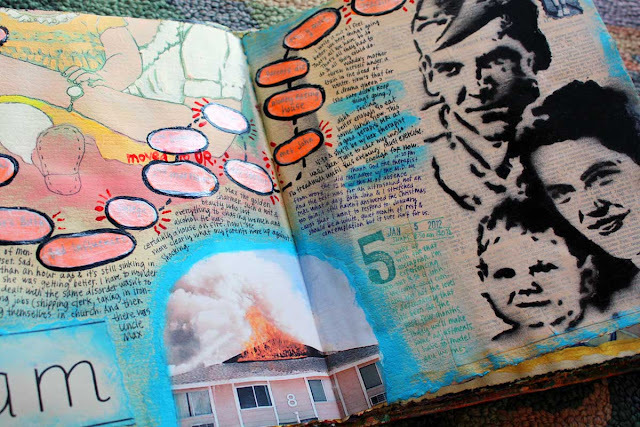 Your art, your journal pages, your words are all so inspiring! thank you!!! i so adore you! Soak it all up!!! Was the artist you were trying to remember was Jonathan Rosen? I hope you are feeling better and enjoying a warmer climate down south someplace. I found your blog through a retweet by Carla Sonheim of a tweet by Jess Greene who mentioned your blog. A chain! Your art is beautiful and I love all of the thought behind it all. No need to reply because I know you are far away, but I had to tell you how cool it is that you emailed me to give me your address, from Mexico! I was going to send you something but I will wait until you return! I absolutely love this post Judy! The monkey is my favorite!! !